The plane model itself - the A350 design - is not new, but the XWB, “Ultra Long Range” variant is a step forward for the technology that allows the aircraft to fly for so long without a break. The plane can fly for over 15,000km without stopping due to a new kind of engine, made - as is usual for Airbus jets - by British manufacturer Rolls Royce. This engine uses less fuel and includes a change to the fuelling system, allowing the plane to carry up to 24,000 litres of extra kerosene than normal, without needing to be refuelled. The system will also use 25% less fuel overall, Airbus has said. Airbus is a European-wide initiative - including manufacturers and engineers in France, the UK, and Spain - with headquarters based in Toulouse (Haute-Garonne, Occitanie). 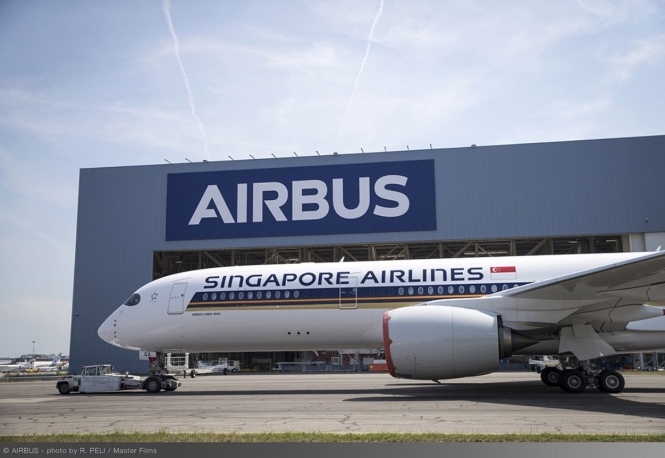 The specific plane that was unveiled this week has been bought by far east company Singapore Airlines, and already bears its branding. The plane has just completed its pre-flight testing. Singapore Airlines has ordered seven units of the new model, and is set to receive the first deliveries within the next few months. The airline is expected to use the planes on its long-haul route between Singapore and the USA; and between Los Angeles and San Francisco. The unveiling of this commercial jet comes just weeks after Airbus revealed its new "whale-shaped" cargo plane, the Beluga XL - the successor to the Beluga ST, which it often uses to transport parts of its own other plane models. The Beluga XL, for example, is large enough to carry two A350-sized wings per flight ahead of construction, rather than one alone. The Beluga XL will come into service from 2019.